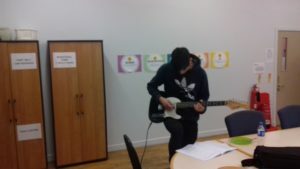 Thanks to continued funding from Creative Scotland we have been working, over the last year, on a new addition to our music activities available at CY called RockSchool. This is a graded music qualification that focuses on contemporary music and allows people to improve their music skills and knowledge and gain accreditation for their achievements. 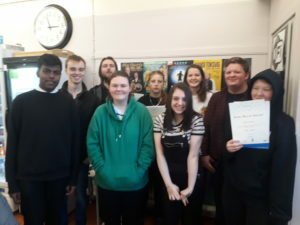 A group of young people attended weekly sessions with our drum tutor, Siggy, and guitar tutor, Conal, and worked really hard to improve their playing skills and understanding of music theory in preparation for sitting the exam, as well as having some fun along the way! We were delighted when 4 young people overcame their nerves and performed amazingly well at their exams to achieve certificates. Jamie- Grade 3 Guitar, Orla- Grade 5 Guitar , Shane- Grade 1 Drums with Merit, Joplin – Grade 2 Drums with Merit. We are super proud of everyone involved, a huge congratulations and well done to them all. A special shout out to Conal & Siggy for all their hard work and support.